Light duty trucks offer the versatility a smaller vehicle can’t, here at Hartman Automotive, we are happy to help you maintain your truck by performing any maintenance or repair services it may require now or later down the road. We know how much you rely on your truck, whether it is for work or weekend hobbies we can help keep your truck operating at its peak level of performance. Most modern vehicles including trucks can now go longer between recommended service intervals, but it is important to keep in mind that your manufacturer’s maintenance suggestions are based on ideal driving conditions. Towing, extreme weather, or long stop and go commutes can quickly be considered severe driving condition and can significantly shorten time between suggested maintenance intervals. Once we get to know you and your truck, we will be happy to provide you with a suggested list of maintenance and repairs based on the current condition of your truck. Our goal at Hartman Automotive is to help you keep your truck both safe and reliable for as long as you choose to own it. Hartman Automotive is your best choice when needing light duty truck maintenance. 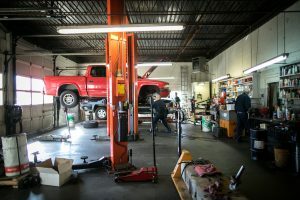 We can give you the peace of mind you are looking for when having a professional technician perform a repair or maintenance service on your trusty truck. Regular maintenance is one of the most cost effective and efficient ways to keep your truck operating at its best. Scheduled maintenance such as oil changes will allow us to inspect the vulnerable components of your truck such as belts and hoses. By catching cracks or leaks while they are small will help you avoid hazardous roadside breakdowns or getting stranded at a job site. Give us a call with any questions you may have about maintaining your light duty truck or fleet. Our automotive technicians are both skilled and knowledgeable with several years of experience. Any light duty truck repair in Littleton, CO done at Hartman Automotive will be provided with our 3 Year / 36,000 Mile Warranty. We take pride in our excellent customer service and will communicate with you every step of the way so you can make the best decisions for you and your vehicle. Whether you are helping move your roommate’s furniture or completing a five truck job for your company, your light duty truck deserves to be maintained to ensure a long, prosperous life on the road. We are ready to service all your light duty truck repair needs. Give us a call, stop on by or feel free to schedule an appointment online for a day and time that is most convenient for you. Hartman Automotive is here for you whenever you need Light Duty Truck maintenance and repair services.